Consider the odds of winning when those odds are 2 in 800,000. Not good, but when you do win against such heavy odds the victory is that much sweeter. 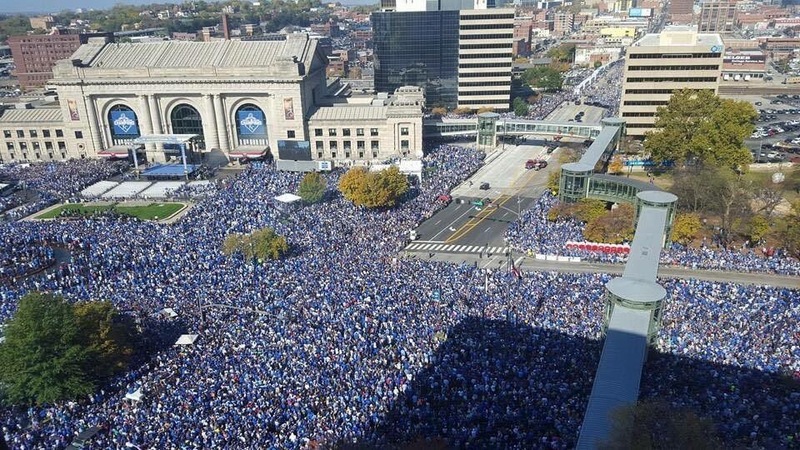 My six-year-old son and I were 2 of the 800,000 people who attended the Royals’ World Series Parade. I had no idea what to expect and it was very out of character for me to attend that type of event but the day unfolded in a way that proves there’s value in stepping outside your comfort zone. We left Clinton at 7:3o am and drove to Kemper Arena to park. Once we arrived at Kemper we got in line for the shuttle buses that were transporting parade goers to downtown. After waiting in a half mile long line for 15 minutes my son said “Dad, can we just walk“. I had no idea where I was going or how long it would take but others had taken off by foot and I was sure they knew where they were going so I said “sure, let’s go” and off we went. We followed a steady stream of people to downtown KC. We could see Union Station which would be the location of the rally but our goal was to see the parade so we headed towards Grand Boulevard. After walking around aimlessly we landed at 20th and Grand and we picked out a spot two rows back from the parade barricade. By this time it was 10:00 am and the parade was scheduled to start at 12:00 pm. The way people were filing in we decided that this was our best spot so we set up camp. By setting up camp, I mean I stood in place and my son sat on my feet and leaned against my legs. At 10:15 my son said “Dad, how much longer“. I responded “an hour and forty-five minutes”. He said “ok“. About every 15 minutes thereafter I got the same question. At 11:00 am he changed his tune, at 11:00 am he said “Dad, I’m hungry“. After standing in place for an hour we were surrounded by a crowd to both sides and behind us. Even if we would have been able to get into a restaurant to get some food there was no way we would be able to push through the crowd to get there so I said “sorry, buddy, we’re going to have to wait until the parade is over“. He said “ok“. At which point I began to question whether or not I made the right decision to attend, he was bored, he was hungry, I was bored, I was hungry and I was worried about something else which lead to the following prayer “Dear God, please don’t let EITHER one of us have to go to the restroom” – that prayer was answered by the way. Every 15 minutes after I got the “now, how much longer” question. Finally at noon I said, “The parade is starting so it won’t be long now“, he said “ok“. What I failed to take into account after proclaiming the parade was starting was that we were over half way down the parade route. He was as patient as a six-year-old, who didn’t really care to be where he was at that moment in time, could be. Finally at 1:00 pm I could see the parade coming towards us from about a block away so I lifted my son on my shoulders and told him to get ready. Again, my estimate of parade travel was way off because it seemed to take forever for the parade to reach our position. People around us were crammed like sardines in a can and the crowd was getting restless. There were so many people it was difficult to even shift your weight from side to side. 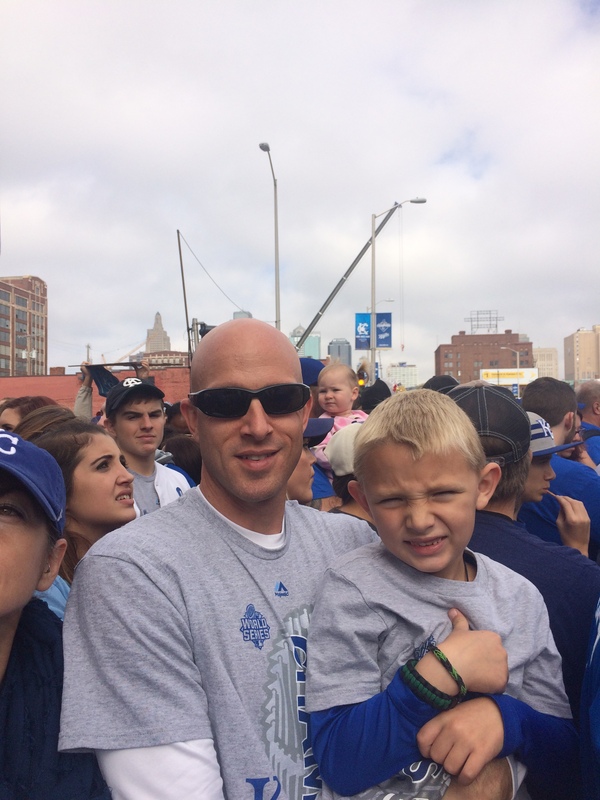 Then something happened, my son was on my shoulders and the parade was still about a half block away when he said “Let’s go Royals (clap, clap, clap, clap clap), Let’s go Royals (clap, clap, clap, clap clap) “, and soon after the entire crowd around us joined him in the chant. The parade reached our destination, the crowd cheered, the chant stopped and my son began to clap and yell as each player rode by in the back of a pickup truck. He had no idea who the players were but it didn’t matter he cheered for each and every one of them as if they were his hero. (In the interest of full disclosure he didn’t watch one minute of the Royals playoff run but you’d have thought he was their biggest fan). The parade passed by in about 20 minutes and the crowd started to move so we had no choice but to follow. As the crowd spilled out into streets and alleyways we finally had room to breathe and what happened next made the entire ordeal worthwhile. My son stopped in the middle of the street and shouted “Dad, that was awesome!”. I said “I’m glad you enjoyed it and I’m glad we got to do it together“. I went on to explain to him that it’s a once in a lifetime deal, knowing that at 6 you really have no comprehension of what once in a lifetime means so I provided some context. I said, “the last time this parade happened I was just a few years older than you are now“. What he said next is where I beat the odds and was rewarded more than I ever thought possible, my son said, “Dad, when it happens again, and you’re old, I’ll bring you!” then he gave me a hug and I teared up. If I could have made time standstill I would have done so at that moment. The Royals won the World Series but I won an even better prize, a moment in time I’ll never forget with my son! To say the events of the day impacted him is an understatement. As soon as he got out of bed the next morning he began to chant – Let’s Go Royals – and just this past week on the way to school one morning he said “Dad, remember that parade“. I replied, “yes, son I remember“. What I didn’t say out loud but thought to myself was “I’ll never forget it and it was one of the best experiences of my life because I was there with you”.